Some of you may recall that I took part in a ‘Tans for Women of Colour’ project a couple of years ago which was created by the lovely LaaLaa and Annie whose aim were to showcase the effects of self tanning lotions across a number of different dark skintones to show that darker ladies could in fact, tan too (see a couple of my posts here, here and here). Since doing that project and seeing the results on my skin from the tans, I’ve been very interested in looking for ways to get my skin looking lovely and bronzed in time for Summer. 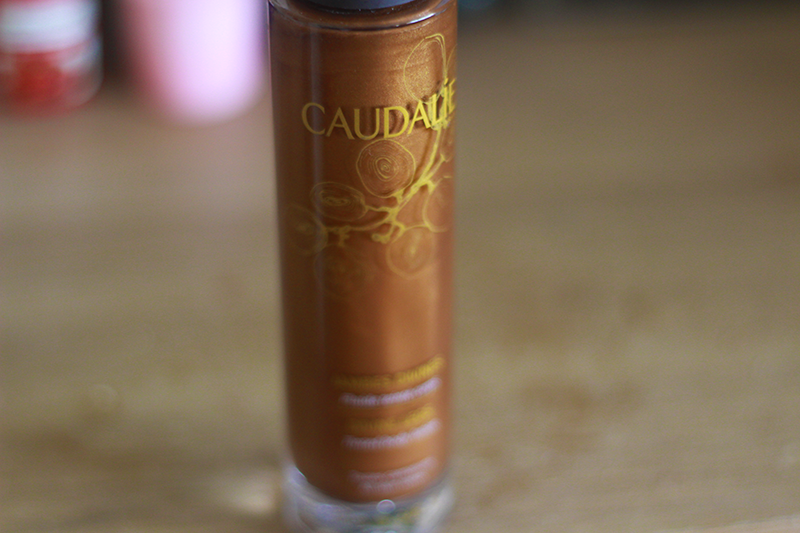 I didn’t want something as heavy as a tanning lotion as I only plan to be showing my legs off really, that’s where Caudelie’s Divine Legs (100ml) comes in. As much as I’d seen a plethora of reviews on this product, to date I haven’t seen anyone of my skin tone try it, so while perusing the isles of Space:NK (unfortunately I have a store DIRECTLY opposite my job..nooooo!) I decided to pick up a bottle and try my luck. 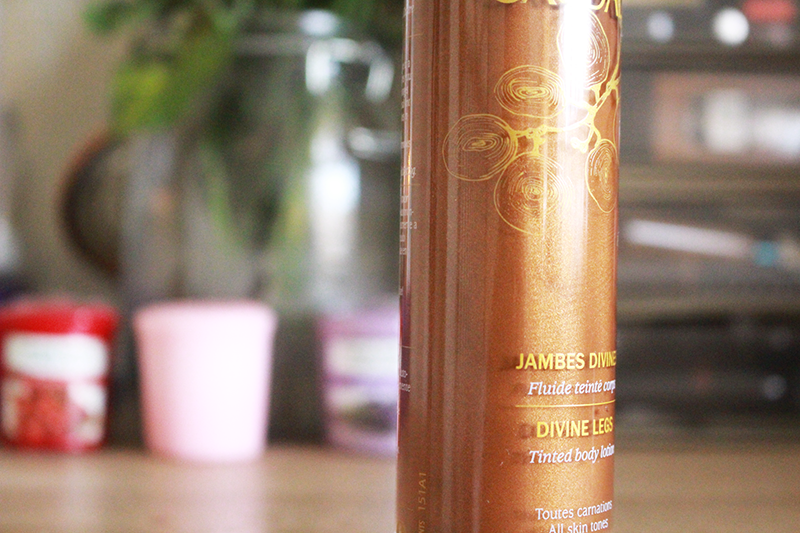 The product is described as being ‘a natural, customised tan without sun and without self tanner‘ and is a heavily tinted moisturiser of sorts, containing brown bronzing pigments which help to enhance the skin’s natural glow. Key ingredients include chicory extract which is extracted from chicory roots in France – it provides an immediate tan effect 60 seconds after application. 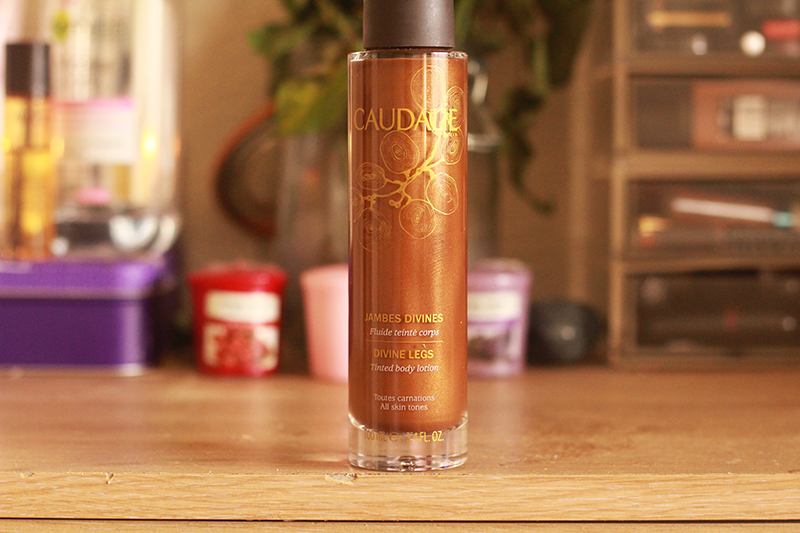 It also contains grape oil, rapeseed oil (which is UHMAZING for retaining moisture) and gold/copper pearlisers which leaves a light, iridescent finish on the skin. You don’t really need mitts for this as it’s quite a light lotion that doesn’t stain and comes off quite easily and only a couple of pumps are needed per leg. I’ve heard that you can use the lotion on it’s own, however I moisturise with a butter or an oil beforehand; I find that this keeps the lotion on for longer. The product sets almost immediately so you have to be quick when trying to even the lotion out otherwise you’ll en up with streaks. 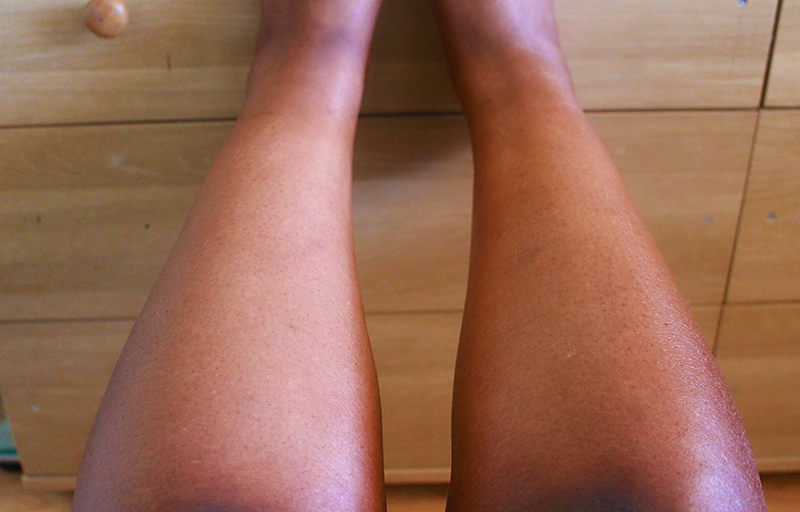 I find that the lotion gives a pretty subtle, golden glow to my legs and it looks AMAZING when the sun hits it. It lasts about 4-5 hours on me and washes off well too. I’m going to try an use it in moderation as it’s a tad pricey for me, however it’s something that I would definitely try again if I ran out. 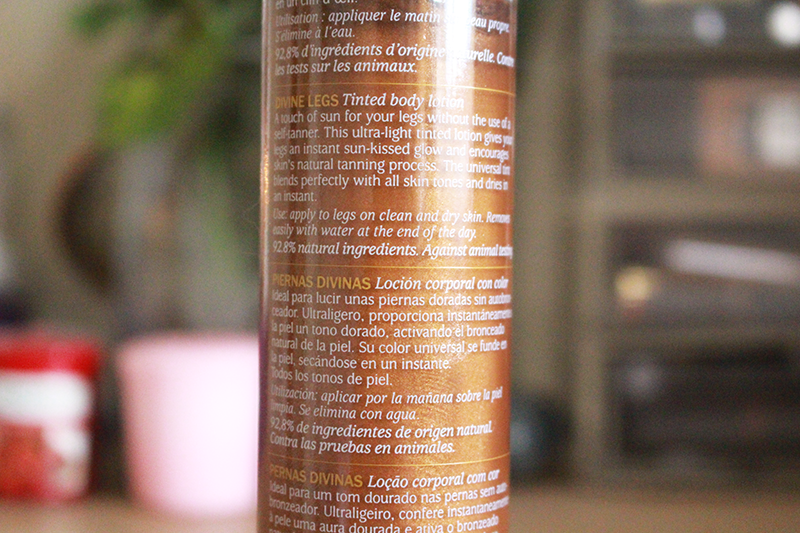 I find it a great holiday essential, a less messy alternative to tanning lotion and very dark-skin friendly!